China’s economic growth rate may be slowing, but the Chinese public overwhelmingly recognizes the economic progress their country has made over time. Most say they are better off financially than they were five years ago, and with near unanimity they believe they enjoy a higher standard of living than their parents did. However, they also believe their country is facing a variety of challenges. In particular, corruption – which has been a major focus of President Xi Jinping – remains a serious concern. Fully 84% say corrupt officials are a big problem, and 44% think they are a very big problem. But people are optimistic that this problem can be dealt with – 63% say the corruption problem will get better in five years. Meanwhile, there are signs that China’s remarkable economic expansion has had some negative side effects. For instance, many Chinese are concerned about air and water pollution, as well as widening inequality. And serious concerns about food safety have nearly tripled since 2008. People express mixed reactions to the rapid changes China has experienced. 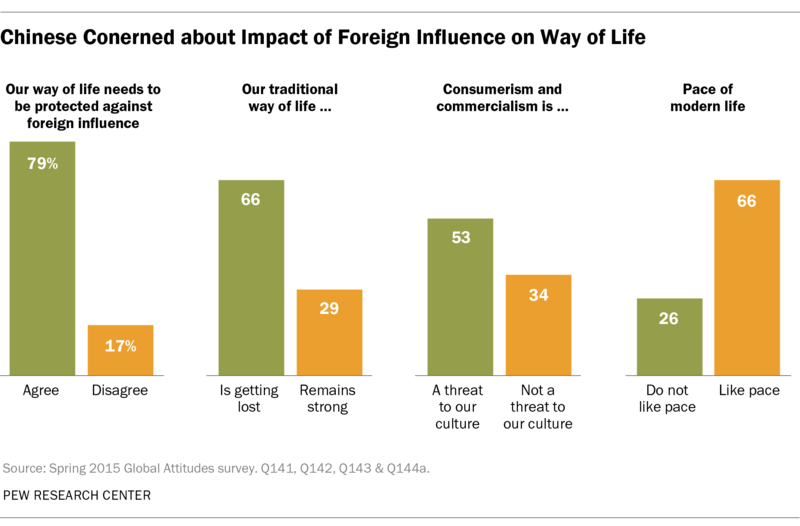 Most say they like the pace of modern life, but they also believe that their traditional way of life is getting lost and that it needs to be protected against foreign influence. And a growing number see consumerism and commercialism as a threat to their culture. Among the 15 issues included in this survey, nine are considered either a very big or moderately big problem by at least 70% of the Chinese public. However, no issue tested is rated as a very big problem by half or more of the population. Concerns over corrupt officials top the list, with 44% of Chinese saying this is a very big problem. Still, this is down 10 percentage points from 2014, when 54% cited corrupt officials as a top concern. About a third of Chinese are worried about environmental damage, with 35% saying air pollution is a very big problem and 34% saying the same about water pollution. Three-in-ten or more cite the gap between the rich and poor, safety of food and rising prices as top concerns. Only about two-in-ten cite corrupt businesspeople, education, unemployment, traffic and working conditions as very big problems for China. Concerns about food safety have risen over the past seven years amid several high-profile scares. In 2008, baby formula tainted with melamine was linked to the deaths of six infants and affected almost 300,000 babies. More recently, nearly a half-billion dollars’ worth of meat was seized by authorities in June 2015, some of it having been frozen in the 1970s. Roughly a third (32%) now say food safety is a very big problem, up 20 percentage points from 12% in 2008. While the safety of medicine and the quality of manufactured goods are cited as a top worry by fewer than three-in-ten Chinese, concerns have risen by 19 points and 15 points, respectively, since 2008. On the other hand, concerns about inflation have eased substantially. In 2008, when inflation stood at 5.9%, about seven-in-ten Chinese (72%) were very concerned about rising prices. With a more manageable 1.4% inflation rate projected for 2015, only 30% cite rising prices as a top concern, a decline of a staggering 42 percentage points over seven years. When asked whether a series of top problems will get better, get worse or stay the same in the next five years, the Chinese public offers mixed views. More than six-in-ten (63%) believe corruption problems will improve in the next five years. A plurality (43%) is also optimistic that progress will be made in food safety. However, the public is split on water pollution: 37% believe it will get better over the next five years, while 34% believe it will get worse. Similar divides are found on air pollution (36% better, 34% worse) and the gap between the rich and poor (35% better, 31% worse). In China’s two largest cities, pessimism about air quality is widespread. More than half of those living in Beijing and Shanghai (53%) say air pollution will get worse in the next five years, compared with roughly a third (34%) of those living elsewhere in China. A recent study linked air pollution to 1.6 million deaths a year in China, with some of the most concentrated sources of pollution found in the northeast corridor that extends from Shanghai to Beijing. On the issue of corruption, optimism about improvement varies considerably by education and income. 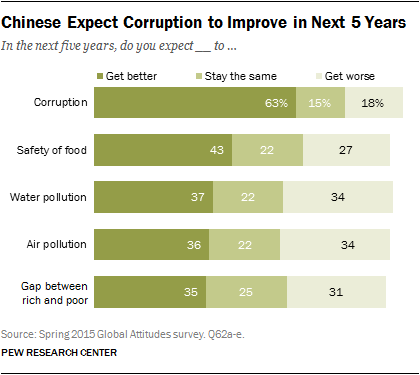 For example, 71% of higher-income Chinese believe corruption will improve in the next five years, compared with 58% of those with lower incomes.2 Roughly two-thirds of Chinese with a secondary education or higher (68%) expect corruption to get better, compared with about six-in-ten among people with less than a secondary education (59%). Despite concern about a wide range of issues, many are satisfied with their economic situation. Majorities in China have consistently rated their personal economic situation positively. In 2008, 66% of Chinese said their personal finances were good. In 2015, 72% hold this view. Roughly three-quarters of Chinese (77%) believe their family is better off today than they were five years ago. Only 4% say they are worse off financially than they were five years ago and 17% say they are about the same. Not only do many Chinese rate the current state of their finances positively, but an overwhelming majority sees the effects of China’s economic advancement over the past generation. Nearly all Chinese (96%) say their current standard of living is better than their parents’ standard of living at the same age. This is relatively unchanged from 2012, when 92% of Chinese said their standard of living was superior to that of their parents’ generation. China’s economic transformation has led to many changes in the everyday lives of its citizens. Most Chinese embrace a modern lifestyle, with 66% saying they like the pace of modern life. However, the same percentage says their traditional way of life is getting lost. And 79% believe their way of life needs to be protected against foreign influence (though only 30% completely agree with this view). In a society with a rapidly growing middle class, slightly more than half (53%) think that consumerism and commercialism are a threat to their culture, up from 43% in 2012. Just 34% say consumerism and commercialism do not pose a threat.